Morris Lee Baker was born on March 23rd, 1914 in Kaufman County, Texas. Moris Lee went by the name “Jack” all of his life. The only place that he was ever Morris Lee was while he was in the Army. He did not even have a birth certificate until he went to service. He entered service on the 22nd of June 1942 at Fort Walters in Texas. After this he went to Camp Hood, also in Texas, on the 7th of November 1942, and was with an MP detachment some time while at Camp Hood. However, this did not work out. On February 25th, 1943, the 97th Infantry Division was reactivated at Camp Swift in Texas. Morris Lee was with this Division during this period, and participated in the Louisiana Manoeuvres during the fall and winter of 1943 -1944. In February 1944 the 97th Division was moved to Fort Leonard Wood. Morris Lee was one of the 5000 stripped from the 97th Infantry Division while at Fort Leonard Wood and used for replacement in other units. 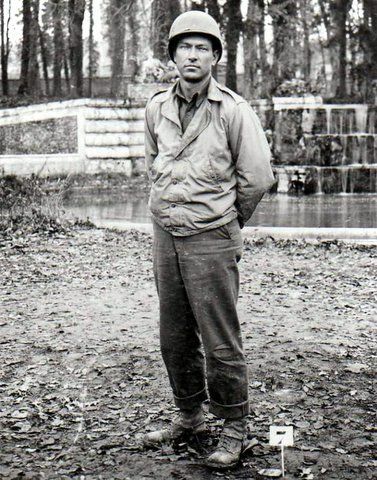 Morris Lee Baker Texas pictured in March 1944. It looks like he is wearing a Service Company Insignia here. Morris Lee departed for England on 12th of May 1944, arriving there on 25th of May, 1944. From here he landed on Utah Beach on the morning of the 10th of June 1944 and hooked up with C Company of the 60th Infantry Regiment right before or during the battle in Barneville. This would have been on or before the 17th of June, and was with them until he was wounded on the 13th of July 1944 near St Lo. Here he was hit by a shell fragment that went straight through his right foot. He was sent back to England to recover from the wound. Morris Lee then returned to duty on the 7th of November 1944 and found himself in the Hurtgen Forest area. He went to a replacement depot for a couple of weeks and then hooked up with E Company of the 47th Infantry Regiment around the 30th of November 1944. He was then wounded again on the 4th of January 1945 near Kalterherberg, Germany, but that was just a slight flesh wound in the left hand and forearm and he was only off the line for maybe two days. 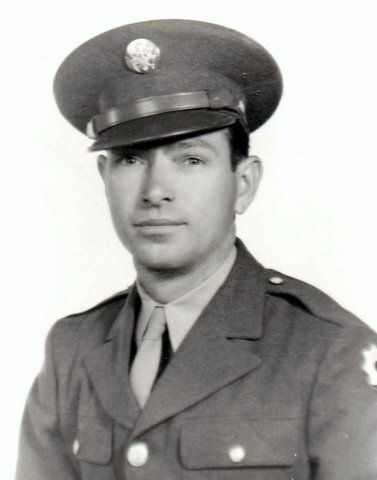 While fighting through Germany, Morris Lee crossed the Remagen Bridge at night on March 8th, 1945 and continued to participate in the brutal battles for the many villages awaiting the men ahead. Then he was again wounded in the left thigh on March 11th, 1945, in Kalenborn Germany. E Company had been across the Rhine River for 4 days and were at full strength when they crossed. A Captain, Captain Frank Petty, later said that when the men were relieved, there were only 28 left. The war was over for Morris Lee Baker. Purple Heart Medal with Oak Leaf Clusters, Bronze Star Medal, Good Conduct Medal, American Campaign Medal, European-African-Middle Eastern Campaign Medal with 4 Bronze Service Stars for battle participation in the Normandy, Northern France, Rhineland and Ardennes campaigns. WWII Victory Medal, Combat Infantryman Badge, Expert Infantryman Badge and the Honorable Service Lapel Button WWII. Morris Lee, or “Jack”, got married in 1946, and became the father of three children. After the war he worked in pipeline construction which he did most of his life. He ran heavy equipment and was a foreman of construction crews. At the age of 68, Morris Lee Baker passed away on July 12, 1984, as a result of a heart attack. PFC Morris Lee Baker shall for always be remembered. I would like to give special thanks to Morris Lee’s son David, who has provided me all this great information.